Romeo & Juliet meets Game Of Thrones. Shakespeare and Dante collide in this sweeping novel of Renaissance Italy. The feud between the Capulets and Montagues starts here! Pietro Alaghieri, son of the poet Dante, falls under the sway of Verona's daring, charismatic, and warlike ruler, Cangrande della Scala. Risking battles, duels, and intrigue to impress his new lord, Pietro uncovers an infernal plot against Cangrande's infant heir. Emerging from the shadow of his famous father, Pietro must protect the dangerous child while navigating a rivalry that severs a friendship, divides a city, and sparks a feud that will someday produce Shakespeare's famous star-cross'd lovers, Romeo & Juliet. Based on the plays of William Shakespeare, the poetry of Dante, and the history of Italy, THE MASTER OF VERONA is a novel of brutal warfare, lost friendship, and dire conspiracy. An epic journey into the birth of the Renaissance that recalls the best of Bernard Cornwell, Sharon Kay Penman, and Dorothy Dunnett. I first read Master of Verona 11 years ago, shortly after it came out. With my memory, that's long enough for me to revisit it, and as most of my reading these days is in my car during my commute, I was glad to find it on audiobook. My opinion hasn't changed--it's still a great read. Now a great listen, too. When I started The Master of Verona, I had no intention of reading a 560 page book in three days. I had other things to do. I read the book instead. 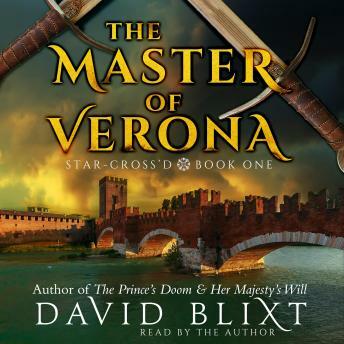 The book's scope of topics is as broad and intricate as a medieval tapestry; just when you think you've seen it all, Blixt draws your eye to a new detail as compelling as the last. There's Pietro, son of Dante, learning to become a knight under the shadow of his famous father. There's medieval Italian politics as vicious as anything you see on The Sopranos. There's great female characters like Antonia Alighieri and Katerina Della Scala using words as devastatingly as the men use swords. There's the historical figure of Cangrande attacking a neighboring city in a battle sequence as vivid as those you find in Bernard Cornwell's Sharpe books. There's a horse race that makes a NASCAR crash look tepid and a duel that only a writer who's also a fight choreographer and swordsman himself could write. Blixt also throws in a mysterious child, assassination attempts, oracular prophecies, and a villain as curiously loathsome as one from Dickens or Dumas. All of this should collapse into an unreadable mess, but Blixt's well-honed prose, characters, and narrative line turned it instead into my favorite beach book of summer 2007 and one of my favorite audio experiences of 2018. Oh, and if that weren't good enough, throughout the book, you come to empathize with the fathers of both Romeo and Juliet and watch as their friendship turns to hate. I can't wait for his next book.